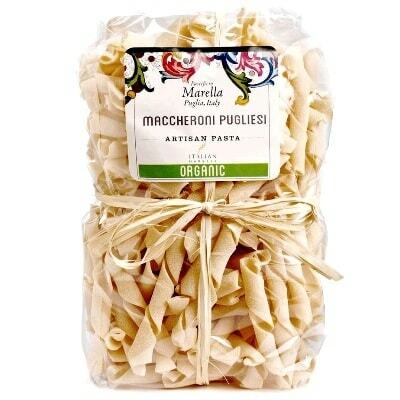 Pretty twisty string pasta from the artisan pasta maker Marella, this bag of Maccheroni Pugliesi is great for all kinds of sauces. Much like tubular pasta, this type is able to hold a lot of your yummy sauce in its hollow center. And it is especially perfect for savory meat sauces. Yes, to catch as much of those delectable tomato or cream sauce in one bite. In addition to that, these lovely twisted pasta strands can make beautiful pasta dishes for special occasions or simple family dinners. They can even be perfect gifts for Italian cuisine or pasta enthusiasts. There’s no time to waste. Get a bag, or two, of these delightfully twisty pasta strands today!